I saw this topic over on Becky's page and wanted to put my weird thoughts on keyboard paper. First off, I whole heartedly agree with Becky. If I could cure cancer, I most definitely would choose that. I feel like veery day I read a new story about a child losing their battle with cancer. Too many close friends and family of mine have gone through this and to be honest, I hate it. There are too many good people being affected by it and I wish someone would just make it go away. But after that little rant, I was thinking more of like an X-Men superpower when I read the title to her post, so I am going to go that route. If I could have one "super power" it would be able to eat whatever the f&%$ I wanted and not gain any weight. Oh, that's not a super power? I don't care. Seriously, I am a person who loves food way too much. And usually the ones I love the most apparently aren't the best for you. 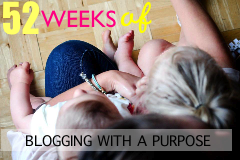 Link up with Becky for 52 weeks of blogging with a purpose!